Wow! What a night in Atlanta! The points lead in the Supercross(450) Class took a dramatic turn tonight as Villopoto came up short on a jump. Somehow as he was going down the exhaust on Villopoto's bike was packed full of red Georgia clay. Ryan frantically tried time and again to start the bike not realizing the problem. He exited the track where one of his mechanics immediately saw the problem, but by then it was too late. With a 19th place finish he'll have to overcome a devastating drop in points to bounce back on the season. Josh Hill continues to struggle getting in the middle of the pack on the start and working his way back to a 6th place finish. 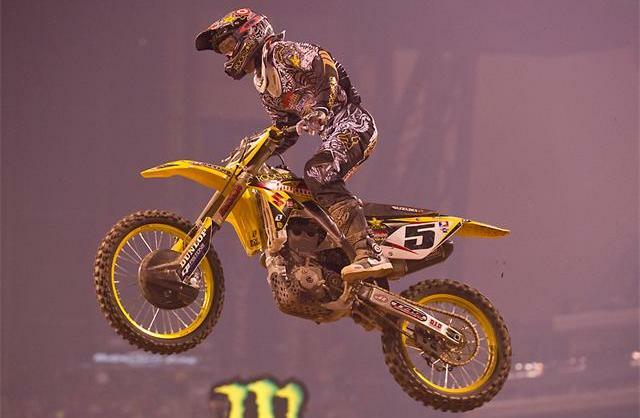 Millsaps didn't start great either, but rode really well and was able to come in 3rd to get on the podium. Amazingly 2nd place went to Western Lites rider Trey Conard who is riding for Honda instead of the injured Andrew Short. He looked at home on the big bikes and was able to capitalize when Villopoto went down. It was Ryan Dungey's night! He was UNTOUCHABLE out of the gate grabbing the hole shot in his qualifying heat and the main. Whatever changes he made to his bike this week really paid off! The bike was a rocket on the starts, getting almost a full bike length ahead before the first turn. Having a good gate choice was key as well which is something that he didn't have last week. The track was slicker than normal tonight and the corners were very flat making it hard for many of the riders to find their groove on the turns. Those that were able to cut in tight and make tight quick turns did the best. Dungey now takes a rather commanding lead on the season as he is a full 20 points ahead of Hill and 23 ahead of Villopoto who was tied with him going into tonight. Kevin Windham had a crazy little wreck where his bike ended up jumping the barriers and going into oncoming traffic where he had to wait for riders to pass so he could reclaim his bike. Luckily the bike landed in a trough where riders where jumping over it, but it cost Windham and took him out of the top ten on a night where he looked like he could do very well. It's still fun watching "the old man" ride with his smooth style. He turns 32 tomorrow. The Lites did not disappoint either as there were many lead changes and a real battle where everything changed 4 laps before the finish and Pourcel took the lead for the 2nd time in the series. Stroupe went down causing Barcia to turn around him so that he didn't go down allowing Pourcel to get the lead. Stroupe was able to salvage the race and come in 2nd however. That is one cool picture you got their, Ryan looks hot on his motorcycle. I would like to be able to watch this live someday, the excitement their must be really high. Thanks for sharing this to us and more power to your blog.